David Lowenthal, in his essential text The Heritage Crusade and the Spoils of History, contends that blood – in particular the real or imagined hereditary relationship we share with the past – is one of the most basic elements of heritage. We might have an actual lineage to a particular past, or we imagine that we ought to, and as such, we claim certain traits, identities, and histories as our own. Lowenthal’s contention came to mind today when thinking about the World Cup and, in particular, how we as spectators choose which team to support. In the case of those fans from the 32 nations in the tournament, perhaps the choice is fairly clear. However, even then, often times those fans will have hyphenated support – or, will choose the country of their ancestors first before supporting their country of residence or citizenship. Here in the US, I know several people who are supporting Italy, or England, or Chile – as well as the US – because of their family’s background, or because they feel they have a tie (and, sometimes, a stronger tie) to those countries than they do the US. England – My mother is English (though she’s spent almost all of her life in Canada) and I have many personal and professional ties to the country. Furthermore, there’s a weird colonial attachment I have to England. So, my attachment is part blood, part identity, I suppose. USA – I have had to reconcile my support of the “Eagles” with my national identity. As a Canadian, I’m not really supposed to support the US. Yes, our nations are closely related, we are very similar culturally, etc, etc. But, that’s kind of the point. An oft used analogy is that the US is Canada’s big brother and, that as Canadians, we’ve had a hard time forging our own identity. I recall that one US Ambassador to Canada quite astutely observed that the worst thing an American could say to a Canadian is “You’re just like us.” While the American sees that as a compliment, the Canadian sees that as a rejection of anything that is distinctive about the country and it’s identity. So, why am I supporting the US? Three reasons – first, my son is American. 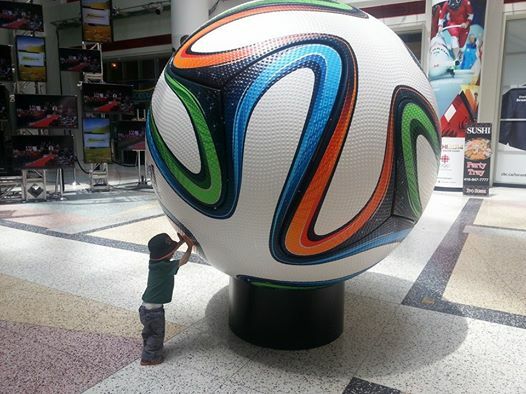 Even though he’s two and has no idea what the World Cup is (though, as the picture below can attest, he does like to try and push a gigantic World Cup soccer ball through the Canadian Broadcasting Corporation’s head office in Toronto). So, blood is a big part of it. Secondly, having worked in the US for over five years now, I know that it is far more than the caricature that many Canadians (and others) ascribe to it. Yes, it is strange and downright scary here at times, particularly culturally, but there is still so much good here that it’s hard not to really, really grow to like it. And, finally, I like underdogs – and the US team certainly is one at this tournament. Belgium – I don’t have any Belgian heritage, at least in terms of blood, but I spend a great deal of time there each year professionally and I really have fallen in love with the country. And, well, there’s a nationalism component to it as well, given the role of Canada in defending Belgium in the First World War. Point is, I suppose, that heritage does play a role in how we view the World Cup – and, really, I can’t think of many other competitions where we are so flexible with how we affix our identity. Even when we choose to root against another team, we often do because of our adopted heritages, claiming distant conflicts, slights, and injuries as our own (as an English supporter, I still root against Argentina at every opportunitiy – even though I have no direct attachment to the Falklands War). As such, there is a strange kind of existential heritage in World Cup fandom that makes it, from my perspective, a unique form of sport heritage. By Gregory Ramshaw in Uncategorized on June 12, 2014 .